Britannia (/brɪˈtæniə/) has been used in several different senses. The name is a Latinisation of the native Brittonic word for the island, Pretanī, which also produced the Greek form Prettanike or Brettaniai, which originally, in the fourth to the first centuries BC, designated a collection of islands with individual names, including Albion or Britain. In Modern Welsh the name remains Prydain. 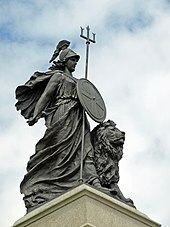 By the 1st century BC, Britannia came to be used for Great Britain specifically. After the Roman conquest in 43 AD, Britannia meant Roman Britain, a province covering the island south of Caledonia (roughly Scotland). When Roman Britain was divided into four provinces in 197 AD, two were called Britannia Superior and Britannia Inferior. Britannia is the name given to the female personification of the island, and it is a term still used to refer to the whole island. In the 2nd century, Roman Britannia came to be personified as a goddess, armed with a trident and shield and wearing a Corinthian helmet. The name Britannia long survived the end of Roman rule in Britain in the 5th century and yielded the name for the island in most European and various other languages, including the English Britain and the modern Welsh Prydain. In the 9th century the associated terms Bretwalda and brytenwealda ealles ðyses ealonde were applied to some Anglo-Saxon kings to assert a wider hegemony in Britain and hyperbolic inscriptions on coins and titles in charters often included the equivalent title rex Britanniae. However when England was unified the title used was rex Angulsaxonum, ('king of the Anglo-Saxons'.). After centuries of declining use, the Latin form was revived during the English Renaissance as a rhetorical evocation of a British national identity. Especially following the Acts of Union in 1707, which joined the Kingdoms of England and Scotland, the personification of the martial Britannia was used as an emblem of British maritime power and unity, most notably in "Rule, Britannia!". The first writer to use a form of the name was the Greek explorer and geographer Pytheas in the 4th century BC. Pytheas referred to Prettanike or Brettaniai, a group of islands off the coast of North-Western Europe. In the 1st century BC, Diodorus Siculus referred to Pretannia, a rendering of the indigenous name for the Pretani people whom the Greeks believed to inhabit the British Isles. Following the Greek usage, the Romans referred to the Insulae Britannicae in the plural, consisting of Albion (Great Britain), Hibernia (Ireland), Thule (possibly Iceland or Orkney) and many smaller islands. Over time, Albion specifically came to be known as Britannia, and the name for the group was subsequently dropped. Although emperor Claudius is commonly attributed with the creation and unification of the province of Britannia in 43 AD, Julius Caesar had already established Roman authority over the Southern and Eastern Britain dynasties during his two expeditions to the island in 55 and 54 BC. Just as Caesar himself had been an obside in Bithynia as a youth, he also had taken the King's sons as obsides or hostages, back to Rome, partially to be educated. The Roman conquest of the island began in AD 43, leading to the establishment of the Roman province known in Latin as Britannia. The Romans never successfully conquered the whole island, building Hadrian's Wall as a boundary with Caledonia, which covered roughly the territory of modern Scotland, although the whole of the boundary marked by Hadrian's Wall lies within modern-day Northern England. A southern part of what is now Scotland was occupied by the Romans for about 20 years in the mid-2nd century AD, keeping in place the Picts to the north of the Antonine Wall. People living in the Roman province of Britannia were called Britanni, or Britons. Ireland, inhabited by the Scoti, was never invaded and was called Hibernia. Thule, an island "six days' sail north of Britain, and [...] near the frozen sea", possibly Iceland, was also never invaded by the Romans. The Emperor Claudius paid a visit while Britain was being conquered and was honoured with the agnomen Britannicus as if he were the conqueror; a frieze discovered at Aphrodisias in 1980 shows a bare breasted and helmeted female warrior labelled BRITANNIA, writhing in agony under the heel of the emperor. She appeared on coins issued under Hadrian, as a more regal-looking female figure. Britannia was soon personified as a goddess, looking fairly similar to the goddess Minerva. [according to whom?] Early portraits of the goddess depict Britannia as a beautiful young woman, wearing the helmet of a centurion, and wrapped in a white garment with her right breast exposed. She is usually shown seated on a rock, holding a spear, and with a spiked shield propped beside her. Sometimes she holds a standard and leans on the shield. On another range of coinage, she is seated on a globe above waves: Britain at the edge of the (known) world. Similar coin types were also issued under Antoninus Pius. After the Roman withdrawal, the term "Britannia" remained in use in Britain and abroad. Latin was ubiquitous amongst native Brythonic writers and the term continued in the Welsh tradition that developed from it. Writing with variations on the term Britannia (or Prydein in the native language) appeared in many Welsh works such as the Historia Britonum, Armes Prydein and the 12th-century Historia Regum Britanniae, which gained unprecedented popularity throughout western Europe during the High Middle Ages. Following the migration of Brythonic Celts, the term Britannia also came to refer to the Armorican peninsula (at least from the 6th century). The modern English, French, Breton and Gallo names for the area, all derive from a literal use of Britannia meaning "land of the Britons". The two "Britannias" gave rise to the term Grande Bretagne (Great Britain) to distinguish the island of Britain from the continental peninsula. Following the Anglo-Saxon settlement of Britain, the term '"Briton" only referred to the native British, Celtic-speaking inhabitants of the province; this remained the case until the modern era. The use of the term as an inhabitant of the island of Great Britain or the UK is relatively recent. It was during the reign of Elizabeth I that "Britannia" came to be viewed as a personification of Britain. In his 1576 General and rare memorials pertayning to the Perfect Arte of Navigation, John Dee used a frontispiece figure of Britannia kneeling by the shore beseeching Elizabeth I, to protect her empire by strengthening her navy. Britain's first road atlas was updated in a series of editions titled from the early 18th into the early 19th century using the title Britannia Depicta. New Zealanders adopted a similar personification of their country in Zealandia, Britannia's daughter, who appeared on postage stamps at the turn of the 20th century and still features in the New Zealand Coat of Arms. During the 1990s the term Cool Britannia (drawn from a humorous version by the Bonzo Dog Band of the song "Rule Britannia", with words by James Thomson [1700–1748], which is often used as an unofficial national anthem), was used to describe the contemporary United Kingdom. The phrase referred to the fashionable scenes of the era, with a new generation of pop groups and style magazines, successful young fashion designers, and a surge of new restaurants and hotels. Cool Britannia represented late-1990s Britain as a fashionable place to be. Although the archetypical image of Britannia seated with a shield first appeared on Roman bronze coins of the 1st century AD struck under Hadrian, Britannia's first appearance on British coinage was on the farthing in 1672, though earlier pattern versions had appeared in 1665, followed by the halfpenny later the same year. The figure of Britannia was said by Samuel Pepys to have been modelled on Frances Teresa Stuart, the future Duchess of Richmond, who was famous at the time for refusing to become the mistress of Charles II, despite the King's strong infatuation with her. Britannia then appeared on the British halfpenny coin throughout the rest of the 17th century and thereafter until 1936. 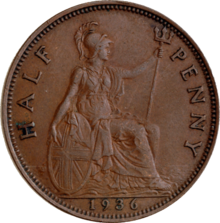 The halfpennies issued during the reign of Queen Anne have Britannia closely resembling the queen herself. When the Bank of England was granted a charter in 1694, the directors decided within days that the device for their official seal should represent 'Brittannia sitting on looking on a Bank of Mony' (sic). Britannia also appeared on the penny coin between 1797 and 1970, occasional issues such as the fourpence under William IV between 1836 and 1837, and on the 50 pence coin between 1969 and 2008. See "External Links" below for examples of all these coins and others. In the spring of 2008, the Royal Mint unveiled new coin designs "reflecting a more modern twenty-first century Britain" which do not feature the image of Britannia. This decision courted some controversy, with tabloid press campaigns, in particular that of the Daily Mail, launched to "save Britannia". The government has pointed out, however, that earlier-design 50p coins will remain in circulation for the foreseeable future. Also Britannia still appeared on the gold and silver "Britannia" bullion coins issued annually by the Royal Mint. A new definitive £2 coin was issued in 2015, with a new image of Britannia. In late 2015, a limited edition (100000 run) £50 coin was produced, bearing the image of Britannia on one side and Queen Elizabeth II on the obverse. A figure of Britannia appeared on the "white fiver" (a five pound note printed in black and white) from 1855 for more than a century, until 1957. From 1928 "Britannia Series A" ten shilling and one pound notes were printed with a seated Britannia bearing both a spear and an olive branch. Britannia is depicted in the Brit Award statuette, the British Phonographic Industry's annual music awards. The statuette of Britannia is regularly redesigned by some of the best known British designers, stylists and artists, including Dame Vivienne Westwood, Damien Hirst, Tracey Emin, Sir Peter Blake and the late Dame Zaha Hadid. SS Britannia, a 1925 British liner, sunk by the German auxiliary cruiser Thor in 1941 with the loss of 122 crew and 127 passengers. "The Britannia" is a popular pub name; there were 82 English public houses with this name in 2011. Britannia Sea Scouts is a sea scouting group connected to Sea Scouts New Zealand located in Evans Bay, in the Wellington zone of New Zealand. Britannia was started in 1927. ^ Creighton, John (31 January 2006). Britannia: The Creation of a Roman Province. Routledge. p. 3. ISBN 9781134318407. ^ "obsides is Latin, meaning hostage". ^ a b "Britannia on British Coins". Chard. Retrieved 25 June 2006. ^ Fleuriot, Léon (1980). Les Origines de la Bretagne: l'émigration [The origins of Brittany: emigration] (in French). Paris: Payot. pp. 52–53. ISBN 2228127108. ^ "Britishness". Oxford English Dictionary Online. September 2008. Retrieved 14 September 2010. ^ Velde, Francois. "Royal Arms, Styles, and Titles of Great Britain". www.heraldica.org. ^ 1901 Penny Universal, Stamps NZ. Retrieved 25 January 2010. ^ National Coat of Arms of New Zealand, Heraldry of the World. Retrieved 25 January 2010. ^ J. Ayto, Movers and Shakers: a Chronology of Words that Shaped our Age (Oxford: Oxford University Press, 2006), ISBN 0-19-861452-7, p. 233. ^ "3 – The Halfpenny". Coins of the UK. Tony Clayton. ^ Morris, Steven (28 January 2008). "Brown blamed as Britannia gets the boot". The Guardian. Retrieved 28 January 2008. ^ "2008 Emblems of Britain Silver Proof Collection". The Royal Mint. Archived from the original on 14 October 2008. ^ "Royal Mint unveils coin designs". BBC News. 2 April 2008. ^ "£5 note, Bank of England". British Museum. Archived from the original on 3 February 2013. Retrieved 24 January 2013. ^ Sharples, BS (17 June 2009). "A Short History of English Banknotes". Retrieved 24 January 2013. ^ a b "Dame Zaha Hadid's Brit Awards statuette design unveiled". BBC. 1 December 2016. ^ a b "Damien Hirst's 2013 Brit Award statue unveiled". BBC. 1 December 2016. ^ "A thousand rather popular pubs... Where's yours?". 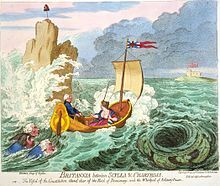 Wikimedia Commons has media related to Britannia.